Front impact test | What Car? A frontal impact with another vehicle is the most frequent type of road crash resulting in death or serious injury, so that's what Euro NCAP's front impact test tries to replicate. 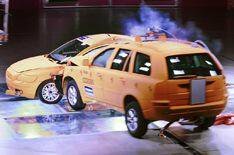 The test car is accelerated to 40mph, with 40% of the front end striking a deformable barrier, imitating a partial head-on impact with a car travelling in the opposite direction. The forces in the impact are equivalent to two cars each travelling at 35mph colliding - the most common impact speed in serious or fatal accidents. The most common cause of death or serious injury for front-seat passengers in these circumstances is when parts of the cabin intrude into the compartment space, either striking the occupants or restricting the space in which the seatbelt and airbags have to work. • A steering wheel-mounted airbag, which must give stable support to the driver's head. • Seatbelt pre-tensioners, load limiters and dual-stage airbags to limit the forces on the body and to stop the driver's chest hitting the steering wheel. • Any parts of the fascia that could impact with a front-seat occupant's knees. • Systems to reduce the distance the footwell intrudes into the cabin, hitting occupants' feet, and the introduction of collapsible foot pedals.